← First Camping Trip of 2013! it is gluten-free too … ahem Adrienne, Laurel, Victoria! 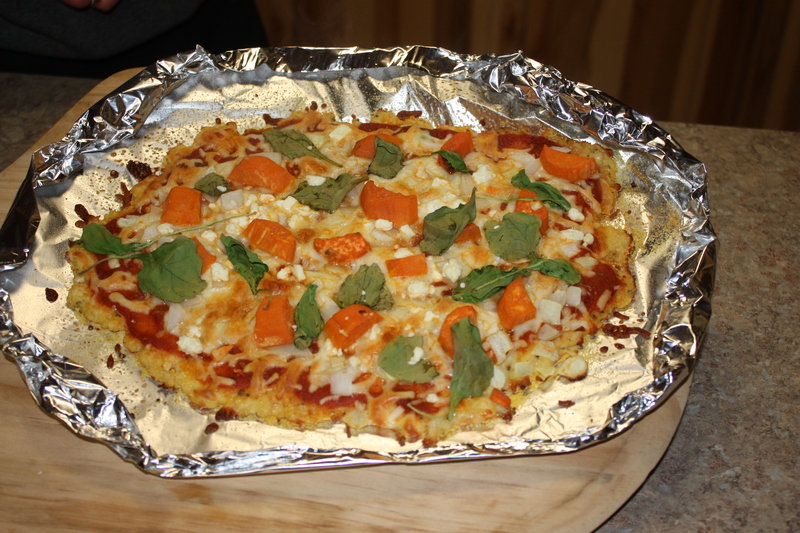 Place a pizza stone in the oven, or baking sheet if you don’t have a pizza stone. Preheat oven to 450 degrees. On a cutting board, place a large piece of parchment paper and spray it with nonstick cooking oil. Wash and throughly dry a small head of cauliflower. Don’t get one the size of your head unless you are planning on making 2 pizzas. Cut off the florets, you don’t need much stem. Just stick with the florets. Pulse in your food processor for about 30 seconds, until you get powdery snow like cauliflower. See above photo. You should end up with 2 to 3 cups cauliflower “snow”. Place the cauliflower in a microwave safe bowl and cover. Microwave for 4 minutes. Dump cooked cauliflower onto a clean tea towel and allow to cool for a bit before attempting the next step. Once cauliflower is cool enough to handle, wrap it up in the dish towel and ring the heck out of it. You want to squeeze out as much water as possible. 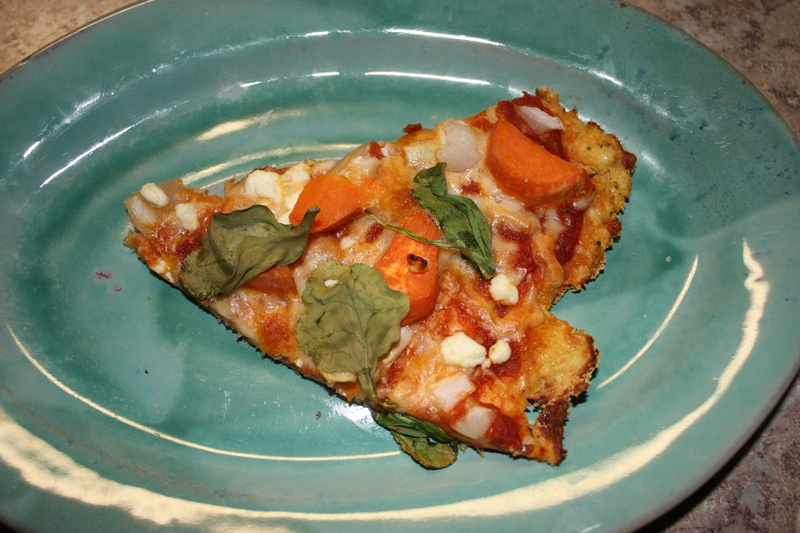 This will ensure you get a chewy pizza like crust instead of a crumbly mess. Dumped ringed out cauliflower into a bowl. Now add 1/4 cup parmesan cheese, 1/4 cup mozzarella cheese, 1/4 teaspoon kosher salt, 1/2 teaspoon dried basil (crush up the leaves even more between your fingers before adding), 1/2 teaspoon dried oregano (crush up the leaves even more between your fingers before adding), 1/2 teaspoon garlic powder (not garlic salt), and a dash of red pepper if you want. Now add your egg and mix away. Once mixed together, use your hands to form the dough into a crust on your oiled parchment paper. Pat it down thoroughly, you want it nice and tightly formed together. Don’t make it too thick or thin either. 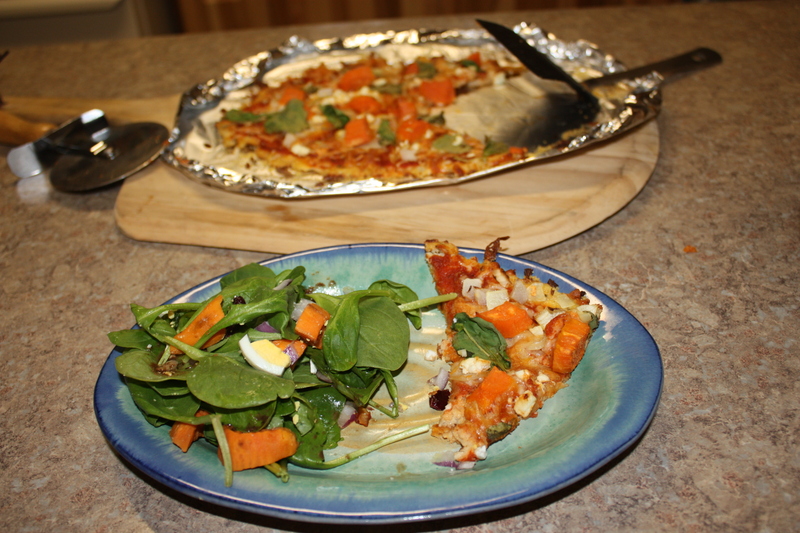 Using a cutting board slide the parchment paper onto your hot pizza stone or baking sheet in the oven. Bake for 8 – 11 minutes, until it starts to turn golden brown. Remove from oven. Add however much sauce, cheese, and toppings you want. I’m not gonna give you measurements for this. You should know how you like your pizza – so go for it! 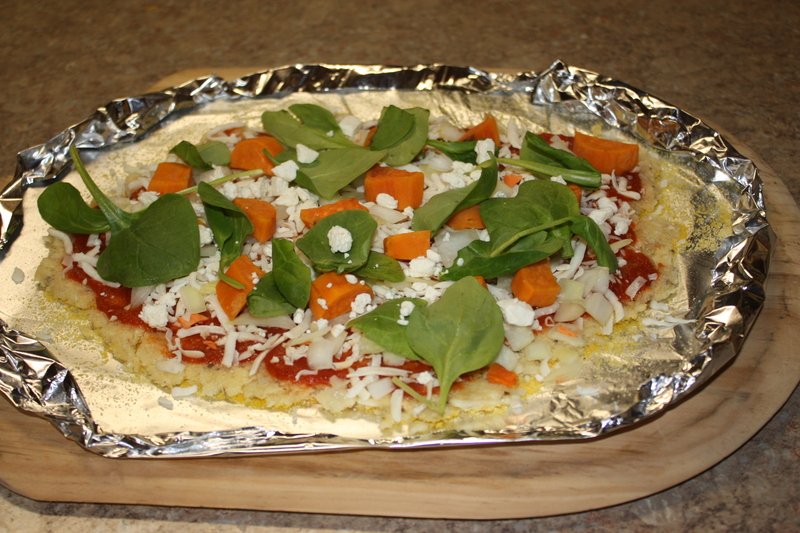 Slide parchment with topped pizza back in the hot oven and cook for another 5 to 7 minutes until the cheese is melted, bubbly, and slightly golden.